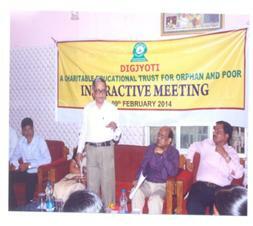 The 7th Annual Interaction of DIGJYOTI family took place in Bhubaneswar on 9th February, 2014 with the participation of Trust awardees, representatives of orphanages, Trust members and social activists across the state. The children particularly were agog with enthusiasm to grab the opportunity of this much awaited interaction to meet everybody and share their experiences. They quickly finished their morning chores and jumped on to the waiting cavalcade for visiting places of educational and cultural interests in and around the city. After a melodious devotional Invocation presented by a visually handicapped scholar, the meeting was opened by the Trust’s Founder & Chairman, Prof. Khageswar Pradhan. In his opening speech he gave a detailed account of the Trust’s activities. The Trust has so far awarded 47 scholarships including 19 this year. 16 past awardees are now well settled in their lives and careers. The Trust has entered into MOUs with two donors during the financial year to award scholarships to meritorious candidates pursuing Graduate and Post Graduate Degrees. The founder Trustee, Mrs. Sucheta Pradhan impressed upon the children to be diligent in their studies; to achieve their goals in life while as a proud member of DIGJYOTI family, keep its flag flying high. 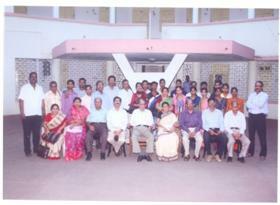 She also appealed to them to extend a helping hand to other needy students who are around them. One boy gave example of his helping a poor boy to get admission by donating two thousand rupees from his meager allowance. Mrs. Nibedita Lenka a social activist whose passion is to help poor and needy students had come forward with some brilliant students and DIGJYOTI is helping them with scholarships. 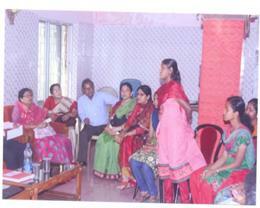 She attended the meeting with Rajashri Parida, the girl who received the Nemichand Jain scholarship. After the meeting, Rajashri received the second installment of her scholarship money. The interactive meeting continued with brief comments from University officers, members of the Trust, representatives of orphanages and social activists and participating students who talked about their rewarding experiences from their association with the Trust. Moved by the heart-touching proceedings, a social activist Mr. Aditya Kumar Nayak chose the occasion to make a donation for the noble cause in helping orphan and poor students. The President of the meeting Prof. Manoranjan Kar, Vice-Chancellor of Orissa University of Agriculture & Technology, Bhubaneswar was all praise for DIGJYOTI for its invaluable contribution to society and assured the university’s continued support in fulfillment of the wider mandate of OUAT to serve the under-privileged people in the state of Orissa.